St. Patrick’s Day is fast approaching. Will your family be celebrating it this year? St. Patrick’s Day is certainly not a big holiday for our family, but we do enjoy the occasional rainbow craft and a bit of leprechaun mischief. This week I’m bringing you the ultimate list of St. Patrick’s Day crafts and activities from a variety of talented bloggers. If you are looking for ways to celebrate St. Patrick’s day, these St. Patrick’s Day crafts and activities are bound to provide plenty of inspiration! Note: You can find this and other St. Patrick’s ideas on my St. Patrick’s Day activities for kids page. Kid Color Pages for St. Patrick’s Day from Crystal & Co. Thanks so much for featuring our Leprechaun Songs! So many great ideas! Have pinned! My pleasure, it is so cute! Thank you for linking up with Hearts for Home! I chose this post as one of my favorites from last week, and I am featuring it on this week’s post. We are also adding it to the Hearts for Home Pinterest board. 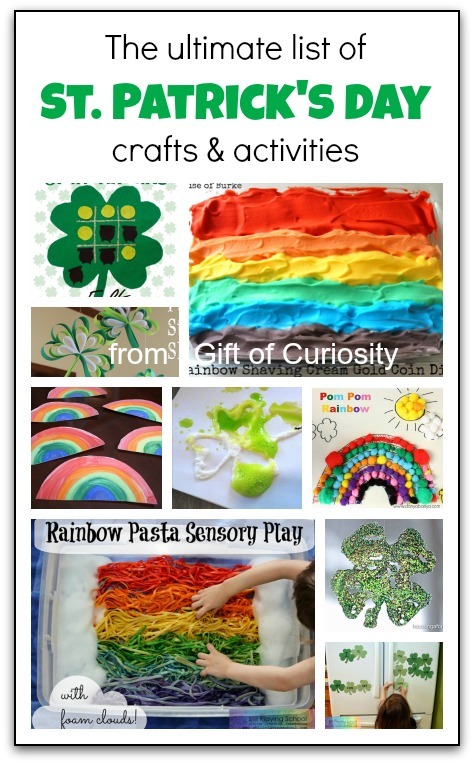 We might spend the entire day doing St Patrick’s Day Crafts ans activities on Monday! There are too many fantastic ones here to just pick one or two!